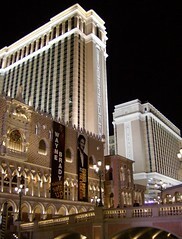 One of Las Vegas' most popular venues, the Venetian offers the splendor of Italy, luxury suites, dozens of restaurants, the Sands convention center, and shows like the Blue Man Group. Most notable about the Venetian Hotel and Casino is the canal which runs through the property, complete with Gondola rides and singing Gondoliers. Don't miss the opera show held in the huge open city square near the center of the property.